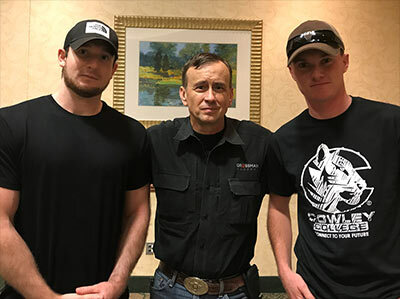 Recently two Cowley College Criminal Justice Students were able to take advantage of an outstanding opportunity when they were able to meet best-selling author, Lt. Col Dave Grossman. Powder Valley, a local reloading supply business, and Grouse Creek Academy teamed up to donate two tickets to the Cowley College Criminal Justice Program so students could attend a conference in Junction City, KS on April 22, where Lt. Col Grossman was the keynote speaker. Volunteers from the program were chosen to represent the college at the conference and a banquet held later. Lt. Col. Dave Grossman is a retired Army Ranger and former professor of psychology at West Point. He is a best -selling author whose books include, On Combat, the Physiology of Deadly Conflict in War and Peace, On Killing: The Psychological Cost of Learning to Kill in War and Society and Stop Teaching Our Kids to Kill. Lt. Col Grossman is a world-recognized expert in the psychology of killing and teaches military, law enforcement, and teachers around the world. He has produced a video and lecture series titled The Bullet Proof Mind. He has been to many of the scenes of school shootings and was a part of the prosecution in the Timothy McVeigh trial. Lt. Col Grossman’s works are featured prominently throughout the Criminal Justice Program at Cowley College with his permission. Sophomore Bobby O’Bryan and Freshman Colter Pickett were chosen to attend the conference and spent their Saturday listening to Grossman. Bobby O’Bryan stated that he was impressed with how passionate Grossman was about his topics. Before lunch Grossman spoke about school shootings and his theories and ideas of armed teachers being a deterrent against active shooters. He also spoke about many ideas to make schools safer places.